Leatherjackets (Tipula oleracea en Tipula paludosa, or Emelten in Dutch) can destroy a perfectly healthy green roof vegetation in months. 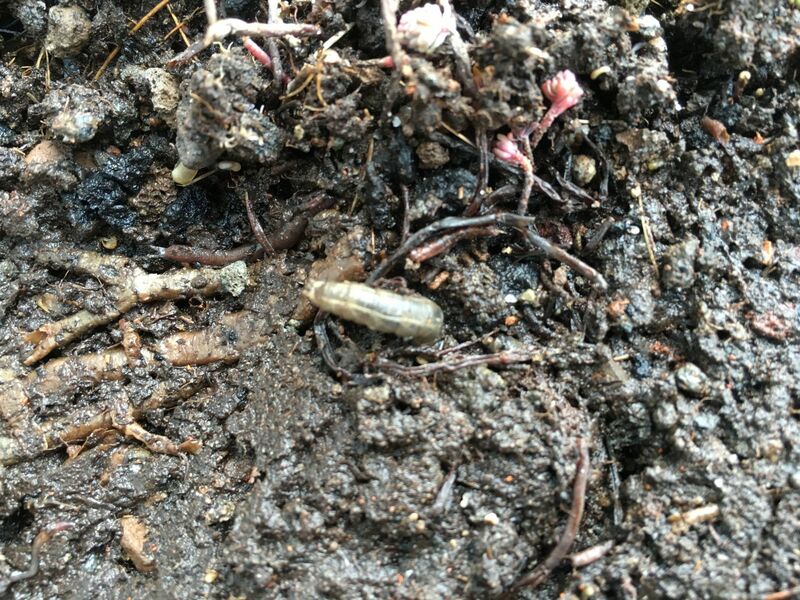 It is not just the larvae feeding on plant and root parts, but also secondary damage by birds digging up the larvae from the substrate destroying whatever is left of the original vegetation. In the Netherlands in 2015 and 2016 multiple cases of severe vegetation damage have been reported. With the following images we want tor provide some guidance in how to spot this plague, and what can be done to stop damage before it is too late. 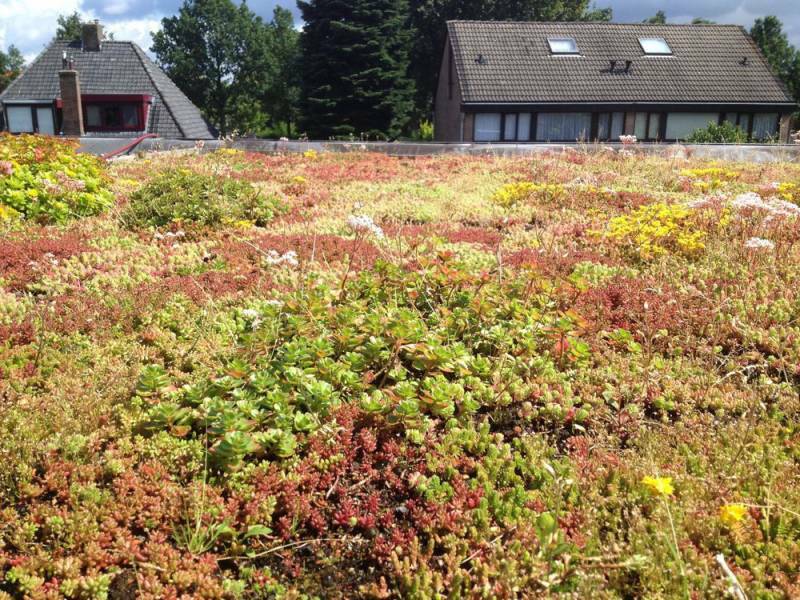 Our experience is that if nothing is done, the entire vegetation will be 'de-rooted' by the leatherjackets and birds, leaving no other option but to replace the entire green roof vegetation, after having eradicated the larvae from the substrate. And then still it will take time to convince birds there are no more larvae to be found: birds will dig up the new vegetation too if they get a chance..
Signs and Symptoms: Sudden and unexplained dead patches in your mixed sedum vegetation. 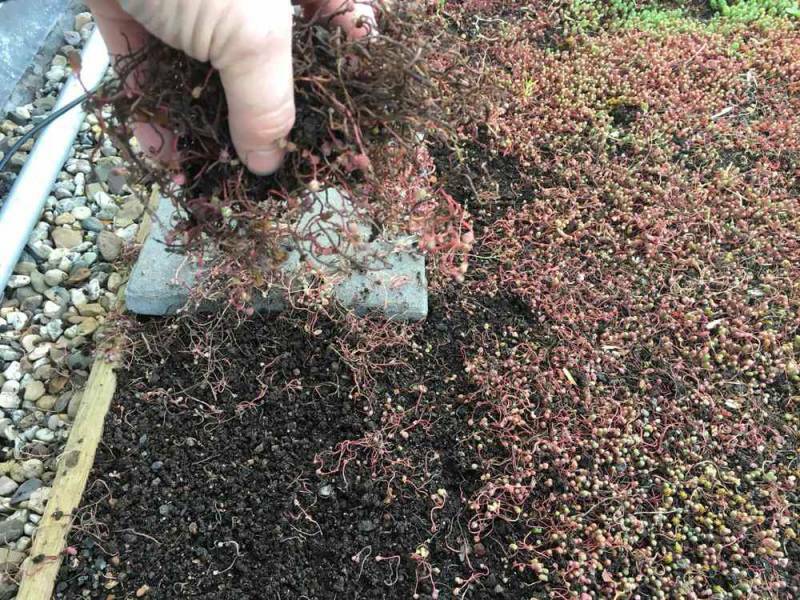 Aboveground Sedum parts can be picked up easily and they do not seem to have any roots anymore binding them to the substrate. More birds than normal present on your greenroof, digging holes and throwing sedum plants around. 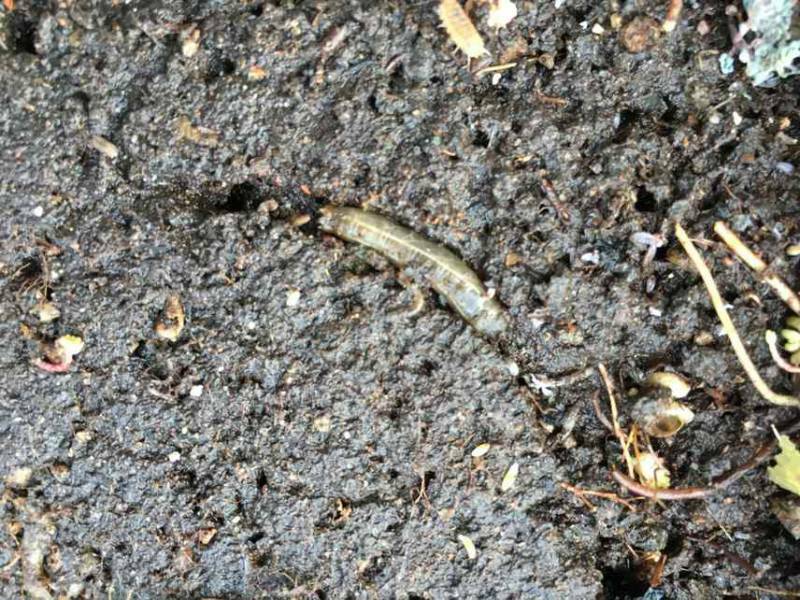 The cause: Grey-brown larvae in the substrate visible under for example tiles, stones or stepping stones, feeding on the roots of plants. The cure: In our project we have been able to eradicate the larvae (Emelten) with biological control with insect-parasitic nematodes (Steinernema spp.). We prefer biological control over chemical control, because we do not want to destroy beneficial soil-life in the substrate too. The insect-parasitic nematodes can be obtained from Biocontrole.nl in The Netherlands (http://biocontrole.nl/plaagbestrijding/emelten.html) and are shipped in a light clay based powder form, which is diluted in two steps (follow instruction that come with your shipment). 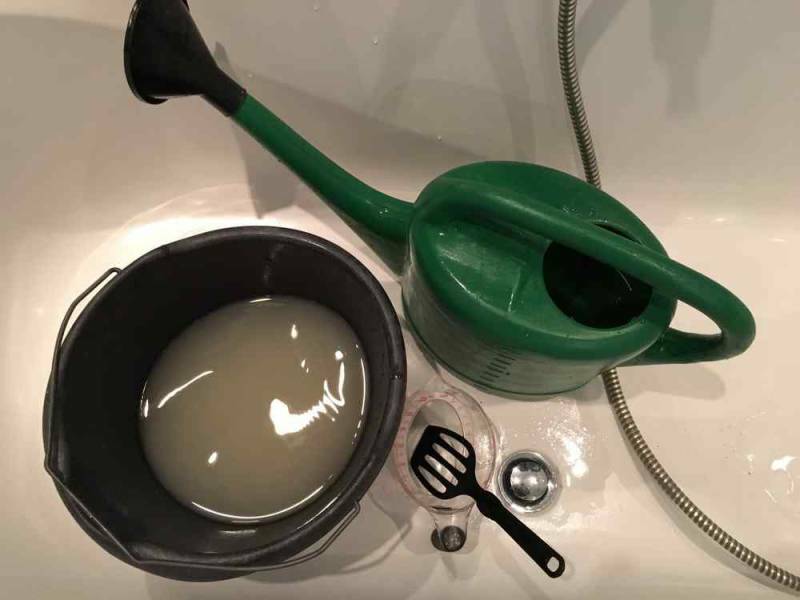 The final suspension can easily be applied with a watering can, during a moist or rainy day, and well after frost has left the region (minimum soil temperature 6-8 degrees C). In 2016 an early spring treatment was very necessary, in 2015 a repeat treatment in summer was necessary too. The Result: recovered Sedum mix vegetation in summer, after Biocontrol of Leatherjacket infestation and replanting of barren parts in spring.